The way I see it, I’m about halfway done with parenting teenage daughters. There are many, many positive moments in parenting teenage girls. We can share shoes and jewelry and hair styling instruments (clothes, not so much). They can be very helpful around the house. Each one is developing into her own individual person with a sense of humor and the ability to carry on meaningful conversations. I love watching them participate in sports and fine arts, and seeing how they continue to develop new interests. But over the past several years, I’ve figured out some ways I shouldn’t go about this parenting teenagers deal. How do I know about these mistakes? I’ve made them all. I’m experiencing this times two on a daily basis. 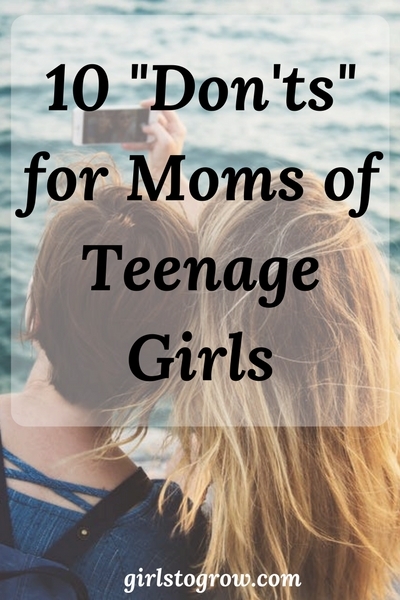 More than anything, this is a list for me to refer back to over the second half of this parenting teens season! 1. Don’t ask too many questions all at once. I’ve found that I can usually get away with asking two or three questions before I begin to sound like an interrogator. However, I might be able to circle back and throw out a question related to the same topic later on and get a decent response. Now this does depend on the personality of your child. Some like to give blow-by-blow details of the day, and are happy to answer any questions you might have. Others just keep most of their thoughts to themselves. I’ve got one on each side of the spectrum. 2. Don’t continue to treat her like a little girl. Okay, so she’ll still act like a little girl at times, but she is growing up. She needs to accept responsibility and, along with that, be granted some new freedoms as she proves herself trustworthy. She can have a later bedtime, handle getting herself up in the morning with an alarm clock, etc. 3. Don’t minimize her feelings. Yes, whatever is causing her world to fall apart may seem unimportant to you, but it’s a big deal to her. She may not want to hear, “I know just how you feel” because likely, you don’t. You may have experienced something similar, but it’s probably not exactly what she’s feeling. I’m trying to learn to just listen, to not offer advice unless I’m asked for it. It’s rare that a daughter wants me to fix something. She usually only wants to talk it through. 4. Don’t respond in the heat of the moment. If your daughter is worked up about something – and especially if she’s upset with you – it almost never does any good to deal with the situation until she’s calmed down. And usually I need time to calm down, too. Much more will be accomplished if we both retreat to our private spaces, and reconnect a little bit later. 5. Don’t feel like you have to answer a request immediately. It’s okay to say, “Let me think about that” when a child asks to do something or go somewhere, and you’re unsure about what to say. You may need a little while to pray about it, talk to your spouse, or find out more about the situation. 6. Don’t get drawn into the drama. If our teenagers suddenly took our “no’s” sweetly and submissively, would we even know how to react? Sometimes they’re going to grumble and complain. Or they may keep trying to suggest a work around that we’ll accept. I’m of the opinion that we should say “yes” as often as we can, but when we give a well-thought-out “no,” we should stand by it. 8. Don’t forget to say “I love you” and “I’m proud of you” as often as you can. Make it a priority. That is all. 9. Don’t think she doesn’t need you anymore. But I know she still needs a mom. A lot of times that just means being around in case she wants to talk, going to the store to pick up that notebook she needs for school, or surprising her with a frappuccino at the end of a hard school day. 10. Don’t neglect praying for her. Prayer is our most powerful weapon against the temptations our daughters will face. It’s also what my heart needs as I struggle to be the mom I should be when our relationship seems less than ideal. Only the Holy Spirit can grow her heart into loving Jesus more. And He’s the only one who can manifest His fruit in me to be an example I’d want her to follow. If you would add another “don’t” to this list, please share it in the comments below! I’ve got just over five years left with a teenage girl in the house, and I’ll take all the help I can get!! I love this list Tracey! We have 3 teenage girls and it is a whole different ball game than little ones. I still love to communicate with them and discover how they think about certain things. Yes, teenage years have their charmes! I agree ~ plenty of charm along with the challenges!! 🙂 Thanks for stopping by my blog and taking the time to comment!